Bored of traditional Italian hotels? Looking for something a bit different? Booking a special treat for your partner and wanting a memorable experience? 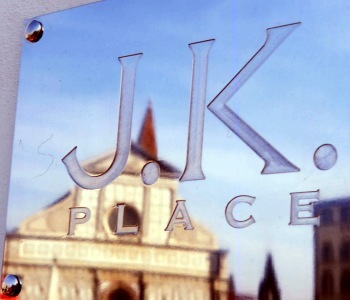 This is our listing of Florence hotels which offer something special to the visitor: high-quality contemporary decor, style-magazine interiors, clean lines, luxury and striking surroundings. If you're looking for a touch of style, youthfulness or just to avoid those patterned bedcovers you find in most Italian hotels, this selection will help you find a chic place to stay in Florence. Recommended here are design hotels, boutique hotels, hip hotels and ambitious B&Bs. Several are luxury standard, others have more reasonable prices. We've tried to avoid those places which are too faceless in their modernity. For a selection of more traditional hotels - where the principal emphasis is on comfort, service and value for money - see our main Florence hotels page. 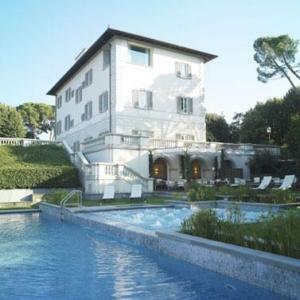 Of Florence's five-star hotels, Villa La Vedetta stands out for its light elegant style, its intimate scale, its modern feel within historic surroundings and its location. An ideal honeymoon hotel, it is a luxurious haven above the city centre, with an outdoor swimming pool and views over the town. Book well ahead, as the hotel only has 18 rooms and suites. 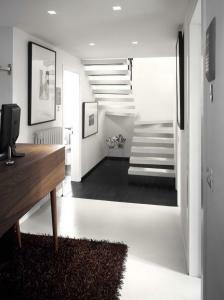 The Hotel Continentale offers just what you expect from a smart modern design hotel. 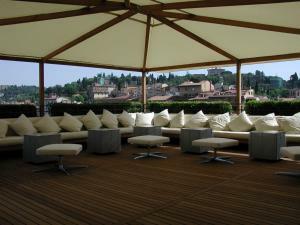 The newish hotel - owned by the Ferragamo family - is ultra-stylish, with a DVD lounge, rooftop cocktail bar and very modern elegance, right in the heart of Florence, overlooking the Ponte Vecchio. A 'hip' hotel does not always earn plaudits from guests for its helpful staff, but the Continentale scores highly all round. A good choice for a special trip, and high on my own travel wish-list. If you really want to splash out on something modern and special, consider this expensive 'boutique' hotel close to Santa Maria Novella; one of the very smartest hotels in town. 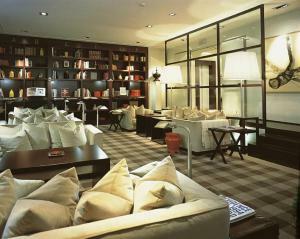 The location is convenient, and this is the sort of lifestyle hotel which features in international magazines. Another of the most prominent design hotels in Florence, the Gallery Hotel Art is a trendy and stylish pad close to the Ponte Vecchio, making it ideal for old-fashioned sightseeing as well as soaking up the hip artistic vibes. The hotel has a trendy restaurant and bar, and hosts art exhibitions. An eighteenth-century building with stylishly-renovated interiors, the Borghese Palace Art Hotel is an interesting mixture of old and new. The hotel features contemporary decor and that unusual feature for an Italian urban hotel: a wellness centre. The handful of studio suites which make up Riva Lofts was awarded 'best new hotel' by Wallpaper Design Awards back in 2008. It is located outside the town centre, to the west along the River Arno. 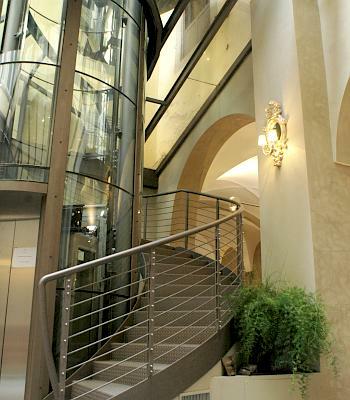 The Grand Hotel Minerva is situated in Piazza Santa Maria Novella, in a building with smartly modernised interiors. It isn't quite as groovy as some, but it does have a small rooftop swimming pool and terrace, making an excellent bonus for summer visitors. The design here may not be everyone's cup of tea (take a look at the photos), but it is certainly striking. The Una Hotel Vittoria makes an unusual place to stay altogether, as it is not in one of the normal hotel districts, but on the far side of the River Arno - about a 20-minute walk (or a bus ride) from the central sights, and with a very different atmosphere. Casa Howard is a sought-after 'lifestyle' destination: incredibly stylish, richly appointed and luxurious. This is for travellers wanting a really special stay surrounded by quality, rather than those worried about budget - although prices aren't always as bank-breaking as you might expect, particularly out of season or if you find short-notice availability (note that you may find there is a minimum stay of at least two nights). 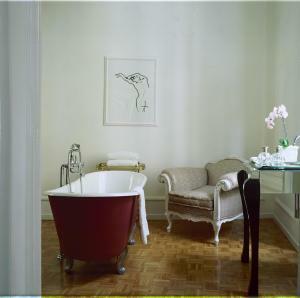 Bedrooms are individually named, furnished and decorated. A much cheaper, but still stylish and modern option is this new 'town house suite', an accommodation category that doesn't offer full service like a hotel but can be very comfortable for a semi-independent stay. The Residenza della Signoria is an apartment right in the historic heart of Florence, and has been refurbished with a light touch to retain historical atmosphere (wooden ceilings and floors) while adding an elegant clean modernity. 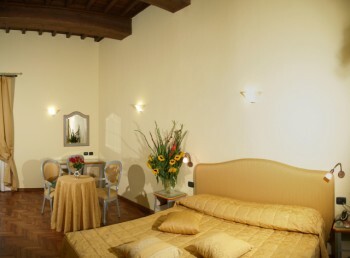 There are just six guest rooms, furnished with king size beds, making the Residenza a good option for a romantic hideaway in the middle of Florence. Breakfast isn't included. A 'design B&B' with just four rooms, this is a cool alternative to hotel accommodation. Decor is simple and contemporary and the service is praised by past guests. 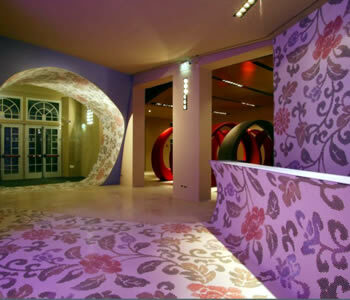 Floroom 1 is located just over the Arno from the main sites, between the Ponte Vecchio and Palazzo Pitti.